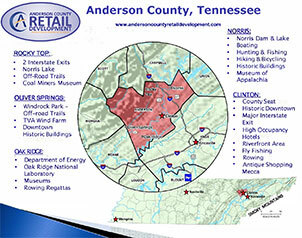 The following information on available commercial properties is constantly being updated. Please contact Janet Hawkins at 865-457-2559 or mailto:janet@andersoncountychamber.org for the latest details or more information. Size (square feet): 700-1550 sq. ft. Sinking Springs Rd. at Frank L. Diggs Dr.
151 Frank L. Diggs Dr.
2423 N. Charles Seivers Blvd. 2408 N. Charles Seivers Blvd. 330 & 334 S. Charles Seivers Blvd. 2233 N. Charles Seivers Blvd. 500 N. Charles Seivers Blvd. 2102 N. Charles Seivers Blvd. 2130 N. Charles Seivers Blvd. & Frank L. Diggs Dr.
2177 N. Charles G. Seivers Blvd. 449 - 453 N. Charles Seivers Blvd. 2028 N. Charles Seivers Blvd. 2130 N. Charles Seivers Blvd. 2228 N. Charles Seivers Blvd.